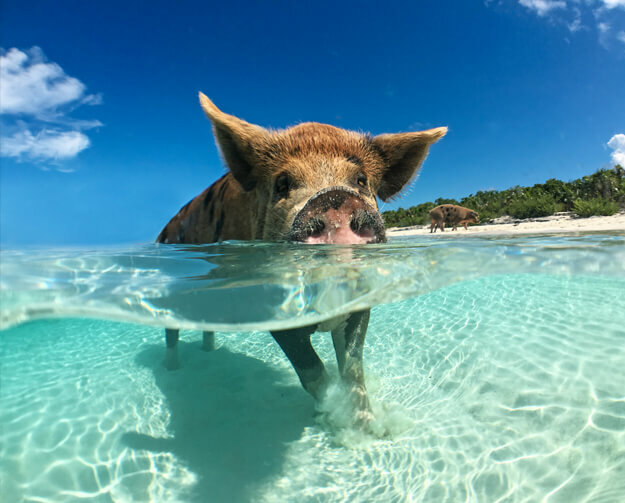 The Bahamas consists of 700-plus pristine islands dotted across the Atlantic Ocean and is one of the most sought-after holiday destinations in the world. These little gems of paradise are synonymous with powdery white sands, crystalline waters and spectacular coral reefs. Our luxury resorts in the Bahamas offer the perfect base to enjoy an easy-going, picture-perfect break in the sun. How could anyone resist the lure of such clear, calm waters? Snorkel or dive among the stunning shoals of sea life including angelfish, stingrays and starfish, as you explore some of the wondrous coral reefs encircling the islands. Take in the glorious surroundings with a spot of kayaking or sailing, or step aboard one of the many leisurely boat trips on offer. Enjoy a memorable ocean safari where you’ll have the chance to encounter an astounding range of marine life, or try your hand at deep sea or reef fishing. If you’re looking for the thrill-factor, head to one of the islands’ awe-inspiring blue holes, such as Blue Hole National Park on Andros, or Dean’s Blue Hole on Long Island, to discover the many underwater caves and submerged wonders. The Bahamian people have an extremely warm and laid-back culture, which is reflected in the relaxed ambience of the islands. Unwind on one of the picturesque beaches or take a stroll among the lush mangrove forests. Treat yourself to a sumptuous spa session or indulge in a leisurely round of golf. If it’s sightseeing you’re after, take a trip to one of the numerous old forts, lighthouses and churches scattered across the islands and get a glimpse of Bahamian history and tradition. For a secluded and peaceful experience, visit one of the many private islands and kick-back on your own little piece of paradise. While the typical Bahamian culture permeates each island, they also have their own unique character and charm. Take a seaplane or water taxi for a thrilling day of island-hopping and experience the abundance of exciting attractions and landmarks on offer. Head to the capital city of Nassau to spend a day visiting the Pirate Museum and browsing for souvenirs at the bustling markets. Meanwhile, the 141-acre Aquaventure on Paradise Island makes for a great family day out, with its fantastic slides, pools and rapids set among lush, tropical vegetation. For something more laid-back, head to the Lucayan National Park on Grand Bahama Island and explore the mysterious underwater cave system. Don’t miss the striking ‘Queen’s Staircase’, carved from limestone in Nassau, or the fascinating salt ponds on Ragged Island. On Eleuthera, learn about the astounding variety of indigenous flora at the Leon Levy Native Plant Preserve, and be sure to visit the Glass Window Bridge, where you’ll be amazed by the contrasting ocean scenes to the north and south. 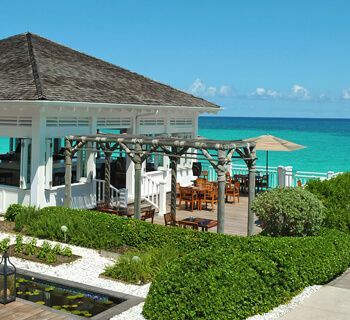 If you’re looking for luxury holidays in the Bahamas, you’ve come to the right place. At Azure, we offer a range of 5 star hotels in the Bahamas to suit your every need, from glamorous city breaks to beachside retreats. Don’t delay in booking your dream holiday with us today. 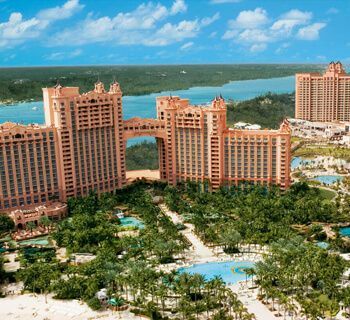 The magnificent Atlantis Paradise Island in the Bahamas offers visitors an unforgettable holiday experience. Easily accessible by a 30-minute private transfer from Nassau Airport, this stunning resort offers grand rooms, inviting turquoise waters, thrilling adventure parks and luxury amenities to indulge in. Sitting on the aptly named Paradise Island, The Ocean Club, A Four Seasons Hotel, Bahamas, is the perfect place for a laid-back break in the sun. Sophisticated and stylish, the upmarket accommodation promises comfort, quality and luxury. Offering top-class facilities and attentive staff, you can rest assured that your every need will be taken care of during your stay.